On First Friday, July 6, The Artists’ Gallery will feature a new series of oil paintings by Karen Merkin in “Ordinary to Extraordinary.” Karen’s photo-realistic style takes ordinary objects such as apples and tomatoes and incorporates such extraordinary detail that the images look real. She is also known for her classic “car portraits.” Each classic car has its own unique beauty, design, and character that is impacted by the reflections of the surrounding environment, especially the chrome and glass surfaces. As a resident of Rockville, the Eastern Shore has become a favorite getaway for Karen and her husband. Karen is a juried member of the Working Artists Forum, an exhibitor with The Artists’ Gallery, and participates in workshops and local shows in Chestertown, Easton, St. Michaels and Tilghman Island. The public is invited to visit The Artists’ Gallery on First Friday, July 6 from 5 to 8 p.m. for light refreshments and to meet the artist. Work by Karen will be featured throughout the month of July. 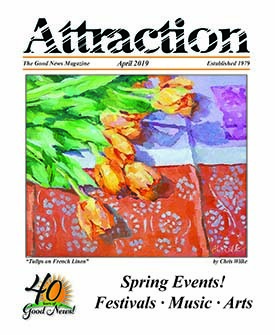 The Artists’ Gallery is located at 239 High Street in Chestertown and is open Tuesday through Saturday from 10 a.m. to 5 p.m. and Sunday from 12:30 to 4:30 p.m. For more information, visit www.theartistsgalleryctown.com or call the gallery at 410-778-2425. 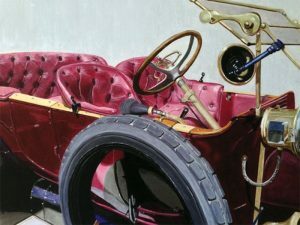 “Ye Olde Cadillac” is by Karen Merkin, the featured artist at The Artists’ Gallery during the month of July.